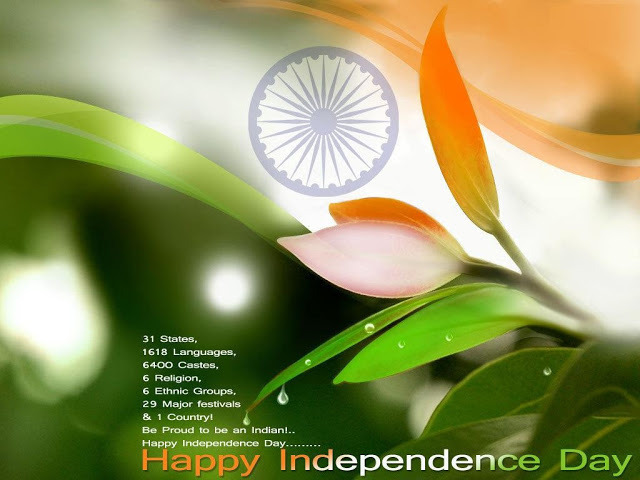 MPVM Celebrates the 69th Independence Day…………. The school campus at Maharshi Patanjali Vidya Mandir was afire with patriotic zeal and enthusiasm marking the 69th Independence Day of our country. The Swaraj Week that was celebrated at MPVM from 10th August culminated on 15th August and was charged with Kalam’s vision of Developed India. The Chief Guest Prof. R.C. Tripathi and the Guests of Honour Dr. Swapnil and the members of the MPVM Samiti namely Prof. Krishna Gupta, Sri Ravindra Gupta, and Sri U.N. Mishra were all accorded a martial welcome by the office bearers of the school. The programme flagged off with the Lighting of the Lamp and the hoisting of the Tricolour followed by the full throated singing of the National Anthem. After the General Salute and the Inspection of the Parade the Principal Mrs. Sushmita Kanungo accorded a warm welcome to everyone present. She reminded the role of each Indian in taking the nation forward and stressed on the need to generate national feeling among the students. Her speech took the audience through a sweeping journey into the richness of India. She described the Indian wisdom for which India has been known through the ages, the rich bio-diversity of nature, the nutritional variety of Indian cuisine, the grace of Indian dress and the warmth and courteousness of Indian manners. A rich variety of cultural programmes was presented by the school students. The school choir sang a beautiful song, Hume Swatantra Tiranga Ka. This was followed by an Incident Enactment by the students of class 10 A recalling the sacrifice of our patriots and martyrs to give freedom to our Motherland. The incident dramatized the 8th April, 1929, plot by Batukeshwar Dutt and Sukhdev to blow up the British Assembly. A beautiful song composed by Sri Jyotikar Mishra on women empowerment Chet re ripu mein nahi asahay abala was sung by Anusha Anurag and Riya Srivastava. The students of the Commerce section of class 11 presented a Street Play on the theme of National Integration. The play showed the hollowness of separatist tendencies that have occasionally tried to divide Indian community, but the secular fabric of the country is a beautiful unbroken yarn of love, tolerance and unity. A group dance to the song “Desh Rangila” was presented by the students of the Patanjali Sarva Shiksha Prarambhik Vidyalaya, followed by a group song Isi din desh mera azad hua hein by the women undergoing vocational training at Mahila Swabalambhan Prashikshan Kendra. These two projects developed for the Economically Underprivileged Sections of the neighborhood are an integral part of the Patanjali family. The Chief Guest expressed his admiration at the variety and beauty of the programmes presented by the school children. He addressed the students as the guardians of our country. In these 68 years it should have been possible to attain our Swaraj, but sadly we are yet to achieve that. He went on to show our deficiencies, the politics of divide and rule, the gap between Have and Have-nots and remarked that our possibilities and potentials must be explored and utilized. Allahabad is a historic place and it was in Allahabad that Swaraj was lost through treaties signed with the British and it is in Allahabad that Swaraj must be established again. The programme ended with blessings from Prof. Krishna Gupta, Hony. Secretary of MPVM Samiti. She said that we must bring Swaraj in our thoughts, in our dreams and in our works. Love, knowledge and mutual help can strengthen our nation, bridge social gap and develop a self-reliant India again. At the end all the guests, teachers and students sang the National Song Vande Matram.